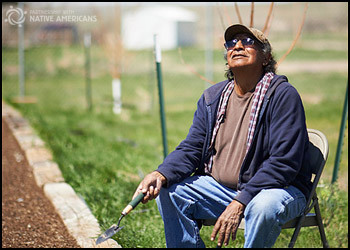 The Acoma Pueblo, about an hour west of Albuquerque, is home to 6,000 tribal members. Most of the community lives in the villages of Acomita and McCartys. The main attraction of this 377,000-acre reservation is "Sky City," located 365 feet above the surrounding valley. The Acoma claim that it is the oldest continually habited village in the United States. Sky City has 250 dwellings, none of which have electricity, sewer or water. The Acoma moved to this mesa to defend themselves against raids by the Apache and Navajo. Not once did an attack against Sky City succeed until the Spanish came in the late 1500's. For 82 years the Acoma were enslaved by the Spanish and converted to Catholicism. 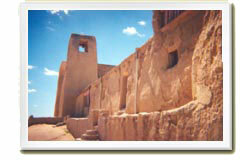 Prior to the Spanish inquisition the Acoma had over 6 million acres of land. 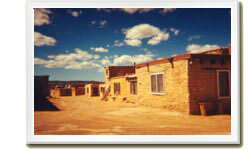 Each family on the reservation owns one dwelling on the Sky City mesa. Many spend time at their homes their during the year. But only forty Acoma live on top of the mesa year round. The homes have been there since 1150. These dwellings are remarkably well preserved. There are hornos throughout the reservation and on the mesa. These are traditional ovens that bake bread by using radiant heat from fires that once burned inside of them. The Acoma people used cisterns to trap water and have been dry land farmers for hundreds of years. The land is quite arid now, but 500 years ago there was much more rain. They raised beans, squash, maize, and pumpkins. The Spanish introduced sheep and horses and the Acoma now raise some livestock. The Spanish destroyed the Acoma religious sites called "kivas" that were on the Sky City mesa. They had the Acoma build a mission on top of where the kivas once were. The Acoma disguised new kivas as homes and continued to practice their native religions. Today the Acoma practice both their traditional religion and Roman Catholicism. The Acoma dwellings are often three stories tall. During the hot summer months they use the bottom floor as food and other storage, the middle floor as a living space and the top floor is for the kitchen (so heat can escape without warming the living quarters). During the cold winter months this is reversed so that the kitchen in on the bottom floor and it heats the living area. The Acoma society is matriarchal and the woman owns the dwellings and the household possessions. 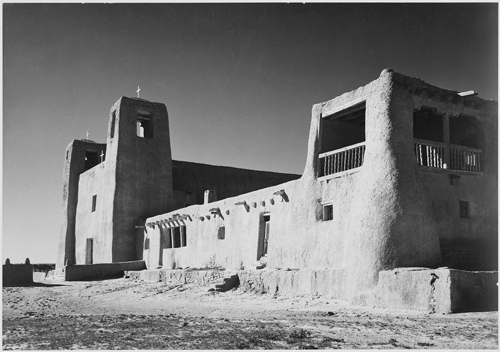 The youngest daughter in each family inherits the pueblo dwelling. In the case where the family has only boys, the youngest daughter of the of the youngest son will inherit the dwelling.